We tend to be readers here at Ignatius Press. You might imagine. But one of the reasons for starting the Ignatius Press Novels website was the experience of being frustrated readers. It’s easy to get the feeling, especially if you follow mainstream press coverage of book releases and best-seller lists, that the once vital and culturally integrated core of Catholic fiction has gone out, that masters like Waugh, Greene, Percy, and O’Connor were the last to be seen of a working Catholic imagination leaving its mark on the literary world. This is false, thank God. It’s also easy to get the feeling that conversation about Catholic literature is either dead or centered on what could be called the “Catholic but” narrative. “Here’s a story about how a young man really loves wearing rosaries and loves his grandmother and also curses at the Pope for all of chapter 3 and has a really rad Hindu experience but eventually, you know, in the end, comes to terms with his Catholic identity,” the critic or even author might say, landing hard on the word identity. “I’m Catholic,” the author is signaling madly, “but not that Catholic.” Similarly it can seem we’re also comfortable discussing the “grew up Catholic” narrative or, most bearably, a story about a crisis of faith—so long as it doesn’t wrap up too tidily. So long as it can be “Catholic, but maybe not”. Fortunately, or providentially, this wholesale retreat is also an illusion. Thank God. But neither feeling is entirely false, either. There are tendencies, particularly in talking about Catholic literature, that make even ardent seekers of fiction springing from the Faith simply miss what’s around. That seems to be why there is recently a minor explosion of interest in Catholic literature, not just in talking about the past but in publishing the new. In fact, a small bunch of independent publishers has sprung up in search of a revived Catholic literature. 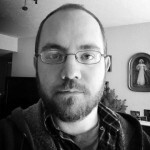 In a post called “Indie Catholic Publishing & the Book as Vessel”, the publisher of a burgeoning press called Labora Editions, Ryan Charles Trusell, peeks up from his own workbench to describe those laboring alongside. This includes Gregory Wolfe of the highly regarded Image journal, now also heading Slant Books. There’s also Tuscany Press (Peter Mongeau), Wiseblood Books (Joshua Hren), and Korrektiv Press, which is driven by a collective including Matthew Lickona, whose memoir Swimming with Scapulars or graphic novel Alphonse you might have read. What? No mention of Ignatius Press?! Well, I guess we’re not a new press, and we’re not primarily known for fiction. We’ve been happily publishing Catholic theology, philosophy, and more since 1978. But that’s okay; let’s come back to that. This resurgence in Catholic publishing must be in response to something, and it seems like it has to be the above reasons—a perceived lack of it being published and talked about. Or it could be finding whatever is published today to be disagreeable or uninteresting, which is a perennial and good reason to start a press. That’s what propelled Mr. Trusell and Mr. Mongeau, for instance. Mr. Mongeau didn’t see it happening generally, while Mr. Trusell thought his book idea was outside of what any publisher he knew about would do, in content or format. And you might say Korrektiv has some opinions on the matter, as their name would suggest. It’s notable that Gregory Wolfe tends to take a different tack. Having long been in the business of publishing authors of (or who address) faith, Wolfe is rarely caught bemoaning the lack of Catholic authors, novels, or readership. (Though, being a publisher, maybe moreso readership.) In fact, it was Mr. Wolfe who shot back at a piece in the New York Times called “Has Fiction Lost Its Faith?” with his own in the Wall Street Journal, “Whispers of Faith in a Postmodern World”. To sum up, Paul Elie in the NYT says literature is post-Christian; Mr. Wolfe counters that we have tons of believing authors, but they fit the times by being (non-pejoratively) quiet, half-suspicious, and sideways about it. To buttress his point, he recently put out lists of believing authors on the Image blog, first at 25 authors and now at 50. One of the striking things about that exchange, however, is that to a large extent Mr. Elie and Mr. Wolfe agree. A work’s connection with the eternal things is very often these days drummed under cover, whether by the literary market or by the author’s encounter with culture. And the seemingly ready-made Christian or Catholic readership can be wary of fiction that isn’t overtly in service of, as much as they see it, the truth. If only there were a place that Catholic readers could go to discover new quality fiction that, no matter how conflicted or entertaining or opaque or triumphant, found its ground beneath the Cross. If only authors knew where to get such work published. 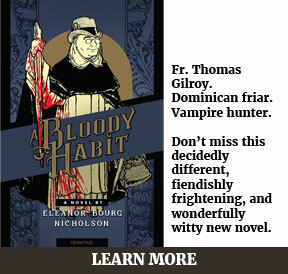 Here we come back to novels of Ignatius Press, and the new ones we’re excited to bring out. We’re proud to be the publisher of Michael D. O’Brien, whose celebrated titles like Father Elijah wed great writing with a deeply Catholic vision. We’ve also, of course, published classic works, whether widely known or deserving of more attention. Our annotated version of the popular The Man Who Was Thursday was spotted in Neil Gaiman’s library (really), while we’ve also brought back the immersive Spanish War epic The Cypresses Believe in God. And saint stories? We’ve got saint stories at all levels, from Louis de Wohl to Taylor Caldwell. But in recent years we’ve stepped up publication of contemporary Catholic novels. We think it’s more important than ever for Catholics to be able to supplement their solid spiritual and doctrinal formation with works of great imagination. So we have new names. Dorothy Cummings McLean, T.M. 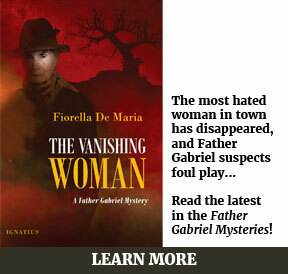 Doran, Fiorella de Maria, David C. Downing, Lucy Beckett, and more. There’s adventure, there’s romance (yes, romance! ), there’s dense characterization, there are mysteries. There is sin and holiness and redemption and tragedy. There’s enough to dive into, and there’s more to come! So we’re excited for a new Catholic literature revival, and we’re doing our part. Answering the question of where to look is a first step, and one as frustrated readers we’ve decided to take ourselves. All the other steps include getting a book and digging in. Starting a book club is a great way to share the reading journey and spread fiction you love with your friends and parish members. Browse our authors or novels to find something you love. Sign up for our monthly newsletter to keep abreast of new fiction and the Catholic literary conversation. Right on! Excellent post, Dan. Is that wearing rosaries, cursing the pope, Hindu thing a real story or a hyperbolic example? Discreetly email me your favorite recent novel published by Ignatius and I’ll order it tout de suite . And God bless us, every one! I’m just tickled to death to read that Korrektiv Press hasn’t escaped your notice. Bless you, sir. Now all that remains to be seen is whether the lot of us can successfully hunt that elusive beast, the Catholic reader. Or for that matter, the non-Catholic reader! Cheers! Good stuff! Glad to be considered in your piece – both as a Korrektiv Kollekitivite and as one of Tuscany’s editors. I’m surprised you didn’t mention one of my favorite Ignatius titles – The Red Horse by Eugenio Corti. 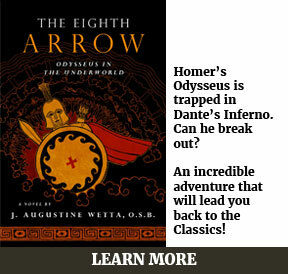 It belongs among the greats – not just of Catholic literature but of modern fiction in general. Ryan, I think it’s hyperbole! I think. Or maybe a point-by-point enlargement of a short story I read somewhere. Seems possible; but probably hyperbole. I had no idea you were JOB, JOB! Very good. And thank you for bringing up Corti’s The Red Horse. That certainly deserves all the attention it can get. And thanks for the tip, OttawaDaddy. (Aren’t internet names fun?) I’ll keep an eye out. All I can think of after finishing Beckett’s A Postcard from the Volcano was, “there will never be another book like it.” The images that came to me as Beckett described the people, the settings, and the engaging conversations…not to mention the beautiful descriptions of the music, the instruments and the emotions stirring inside of the people playing those very moving pieces…it all made my head swim. Man, I miss that book!